Attention Boaters! Stop Aquatic Hitchhikers! Are invasive species interrupting your boating and fishing experience? Did you know that if you conduct a quick inspection of your watercraft before and after each use and remove invasive species, you are helping protect and maintain our beautiful waterways? Did you know that many of the invasive species found on boats during inspections out-compete native species, displace waterfowl, decrease the size of sportfish, hinder recreational boating experiences, and damage our environment? Over the summer, State Parks will have 15 Boat Stewards (Stewards) at many of our boat launches along Lake Erie, Niagara River, Lake Ontario, St. Lawrence River, Lake Champlain, Finger Lakes, and Saratoga Lake. The Stewards will conduct educational boat inspections to provide step-by-step instructions on ways you can effectively inspect your boat and dispose of invasive species. These demonstrations are both free and voluntary. The New York State Park’s Boat Steward Program is one of many boat steward programs throughout New York State. These programs provide targeted educational programming to increase awareness about aquatic invasive species and other environmentally significant issues. When you come across a red-shirted Boat Steward please stop and ask us any questions you may have. Stewards participate in periodic educational events, festivals, and invasive species removal projects, such as water chestnut pulls. Also, feel free to follow us on the Boat Steward Blog. Stewards will be writing about their experiences and findings as the summer goes on. Download an Aquatic Plant ID sheet here. To learn more about other invasive species throughout the state, check out the New York Invasive Species Clearinghouse. Ecosystem-Based Management, sometimes referred to as EBM, is a planning tool. It helps guide decisions on where to place development such as roads, buildings, trails, beaches etc., while also considering the long and short term impacts to the environment. It also looks at how development effects not just the surrounding environment, but also the upstream and downstream environment. EBM helps remind us to take the big picture view when we do work in our State Parks. New York State Parks’ Environmental Management Bureau has been implementing Ecosystem-Based Management (EBM) in our parks statewide since 2008. EBM relies on citizen participation, partnerships, science-based approaches, and taking a long-term view to provide an informed and adaptive approach to protecting our ecosystems while providing park patrons with experiences that connect them to the natural world. Taking this approach allows us to look at interacting systems, like watersheds, rather than individual components, such as a specific plant or animal or isolated water quality parameters. 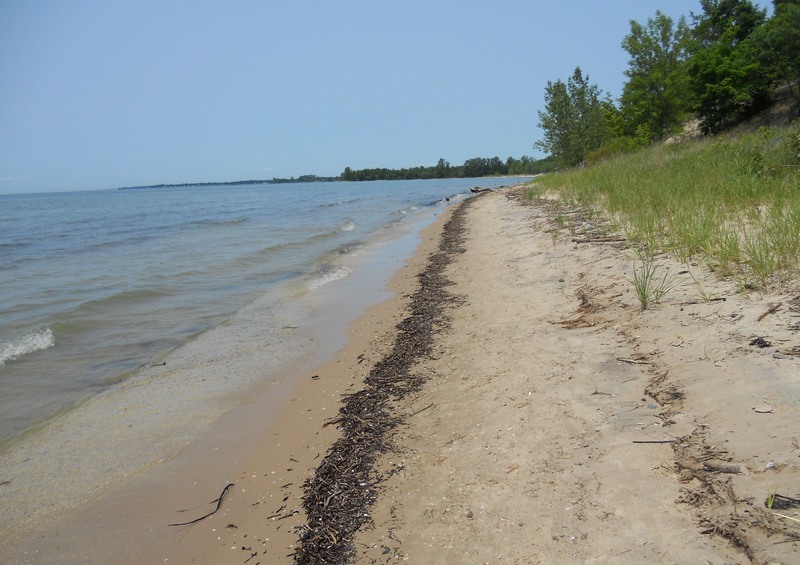 NYS Parks has used this approach to help better understand, protect and manage our resources, such as swimming beaches, lake water quality, forest health, species richness, and aquatic connectivity. In addition to helping us look at our natural environment in a more integrated way, EBM provides a means to communicate with multiple stakeholders including citizens, scientists, the private sector and government officials. Ecosystem Based Management Panels at Sunken Meadow State Park on Long Island. Click to enlarge images. 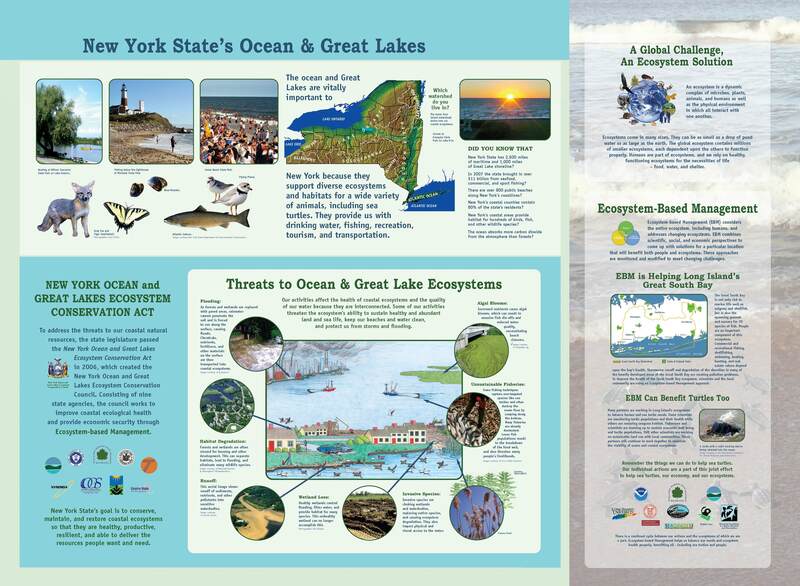 NYS Parks will continue to integrate EBM into programs andactivities through training, watershed educational materials and ecosystem research, as well as projects which demonstrate that healthy ecosystems mean healthy communities. 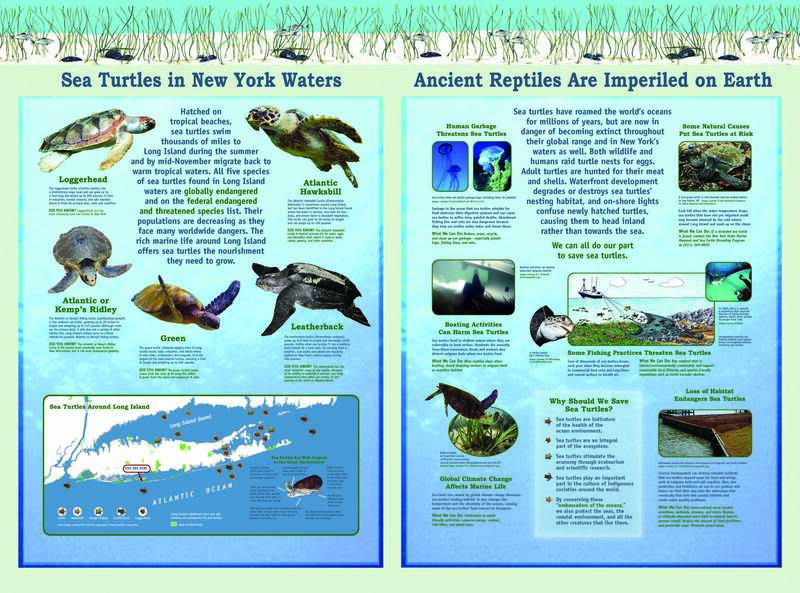 Look for these EBM educational panels at Sunken Meadow State Park on Long Island (pictured above)! More educational panels and kiosks showing how our parks are part of the larger landscape are in the works for parks along the St. Lawrence River and Great Lakes. Keep an eye out for them! Post by Gabriella Cebada Mora, OPRHP. On a Monday in mid-May the 12 members of the 2015 NYS Parks Boat Steward Program piled into two minivans in the parking lot at Hamlin Beach State Park. The vans were packed to the gills with supplies, including snacks for the road, uniforms, plant rakes, 5-gallon buckets, and folding tables. Strict instructions were given to avoid opening the trunk without someone standing by to catch any overnight bags or coolers that may tumble out. To a bystander, our situation likely seemed akin to a scene from the National Lampoon’s Family Vacation film – only we weren’t leaving for a vacation. We were bound for a multi-day training at Paul Smith’s College, where watercraft inspection began in New York State more than 15 years ago. Watercraft inspection has become an increasingly popular way to prevent the spread of aquatic invasive species (AIS) via overland transport. During the training, Boat Stewards learn how to educate the public on AIS, conduct voluntary watercraft inspections remove and dispose of any plant or animal matter, and collect data about the boaters that they interact with. This data helps us to understand how and where AIS are being transported, which regions of the state require enhanced outreach, and where boat washing stations would be most efficiently utilized. 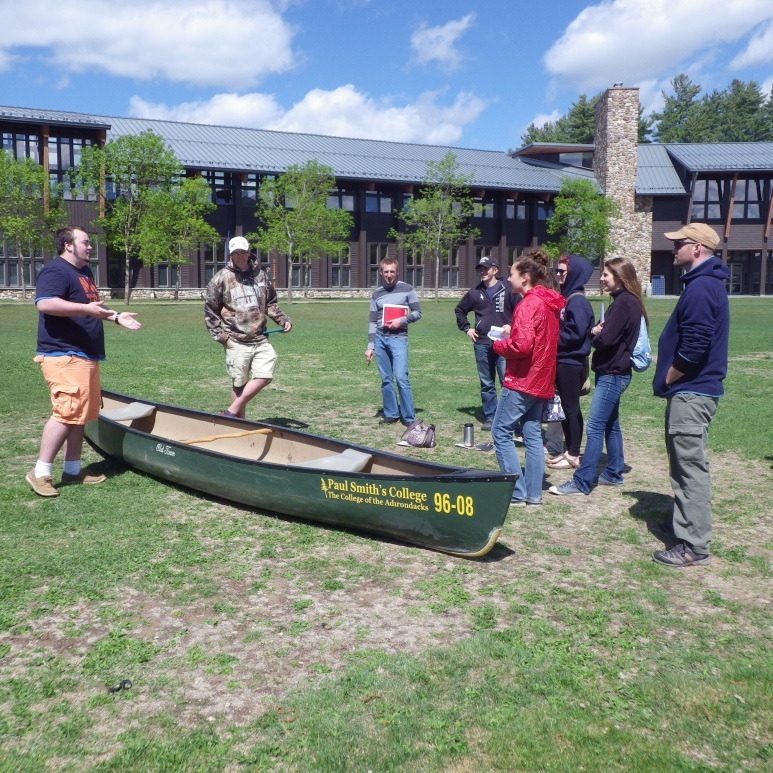 Stewards conducted mock watercraft inspections for AIS at Paul Smith’s College in the Adirondack Park. Returning stewards from the Paul Smith’s program took on various “boater personalities” to help the new stewards prepare for any type of situation that could arise at the boat launch. 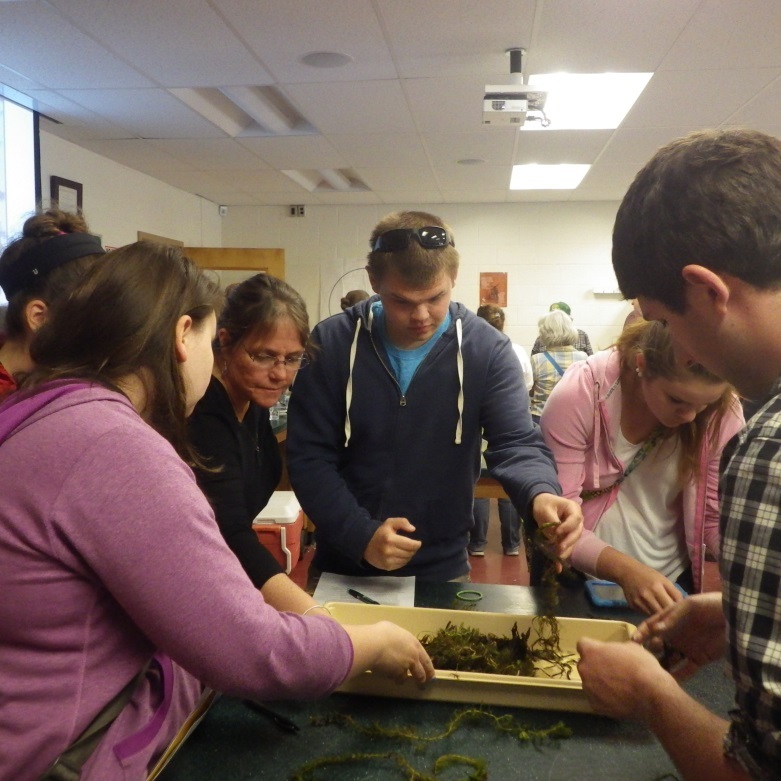 Paul Lord (SUNY Oneonta) held a hands-on invasive plant and animal identification session, which was an invaluable piece of the training for the stewards. After they had time to become familiar with the specimens, stewards were given a quiz! Fast forward to five weeks later, the stewards are trained and on-site at 21 launches across the Great Lakes and Lake Champlain. 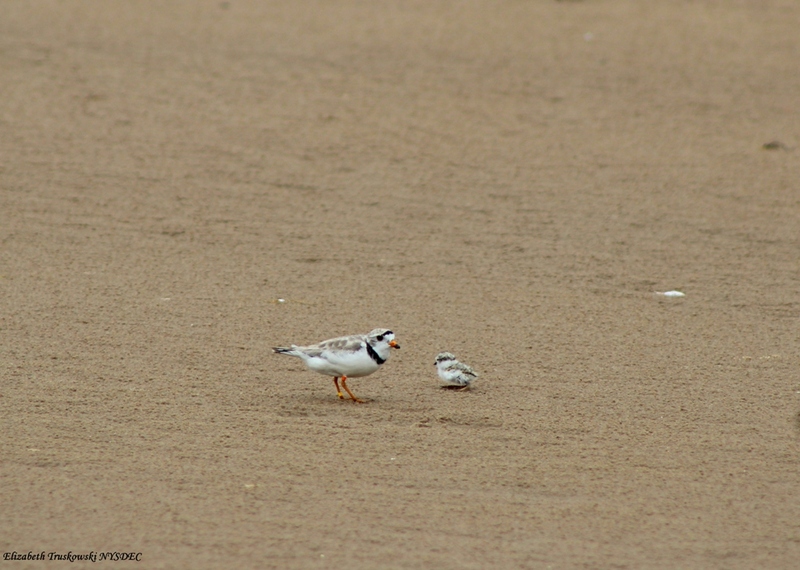 The following images were taken in the field during routine site visits. Above left: Zebra mussels attached to a stick near the boat launch at Point Au Roche State Park on Lake Champlain. Can you imagine how many of these mussels could cover the bottom of a boat?! Banded mystery snails were also found at this location. Zebra mussels and banded mystery snails are just two of 50 known invasive species in the lake. Above right: Melyssa Smith (OPRHP Water Quality Unit) and Ariana London (OPRHP Boat Steward) practice throwing the plant rake from a boat launch on the Great Chazy River. It is still a bit early in the season for significant plant growth; however AIS Eurasian watermilfoil and a native Elodea have been collected at this site thus far. “So far, the two main aquatic invasive species that I have found are curly-leaf pondweed and Eurasian watermilfoil. I keep some samples on my table to show to boaters and park visitors who come by to learn about them. I also throw my rake into the water every morning to gather new specimens. 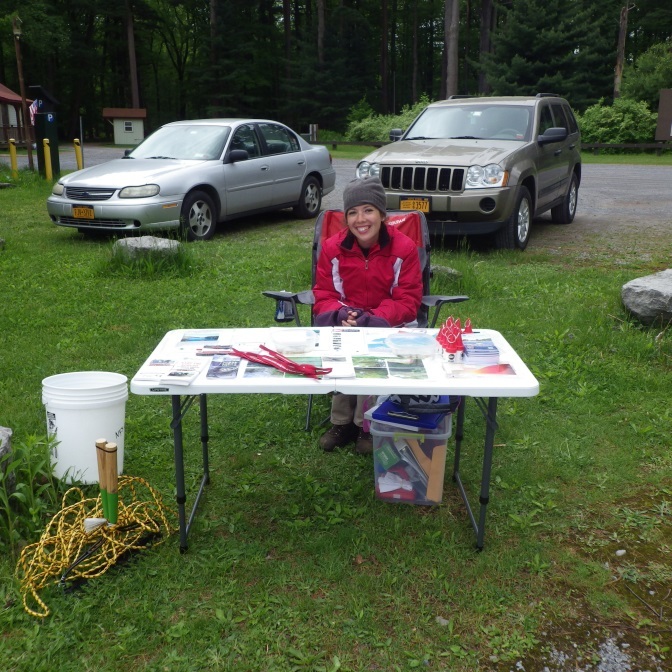 I have been learning to identify many different types of aquatic life!” – Sarah Powers, Salmon River and Lake Ontario steward. Above left: Tara inspects a motor boat that is preparing to launch. “For me, being a Boat Steward is about patience, passion and perseverance.” –Tara Camp, St. Lawrence River steward. Above right: A curly-leaf pondweed specimen on the boat launch at Westcott Beach State Park. Notice how the leaves resemble lasagna noodles. If you encounter a Boat Steward this summer, be sure to ask them how you, a New York State Park visitor, can help halt the spread of aquatic invasive species by adopting a few simple practices when launching or retrieving your watercraft. For more information about the NYS Parks Boat Steward Program, please call (518) 402-5587. Post and photos by Megan Phillips, OPRHP Water Quality Unit. Chimney Bluffs looking east from the shoreline. Photo by Brett Smith. 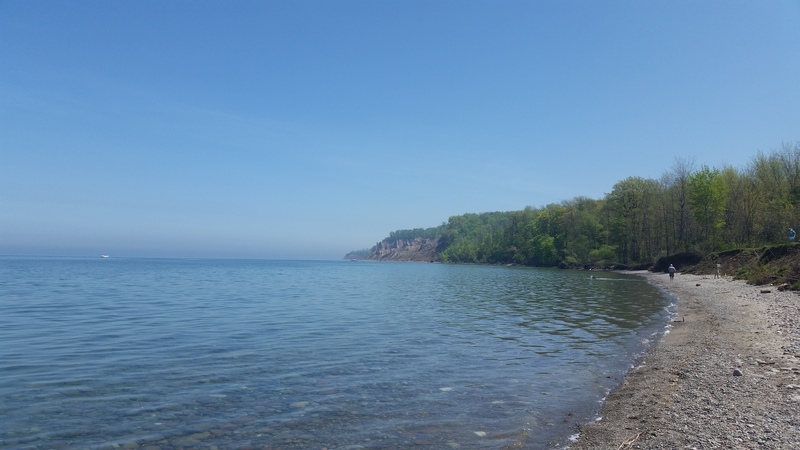 Some people are drawn to water and some are drawn to dramatic landscapes, Chimney Bluffs State Park on the shore of Lake Ontario has both. Located in Wolcott, New York the park’s namesake bluffs stretch for ½ a mile revealing its ever-changing ancient past. Chimney Bluffs looking east. Photo by Brett Smith. During the last ice age from 2 million years ago until about 10,000 years ago there were a series of glacial advances and retreats that formed the Great Lakes that changed the landscape of the north-central part of the United States in many ways. One of the clues that glaciers leave behind are called drumlins. We see drumlins as elliptical hills. These hills are blunt on the upglacier end and taper into and elongated tail on the downglacier end, similar in shape to a teardrop. Drumlins form parallel the direction the movement of the ice. 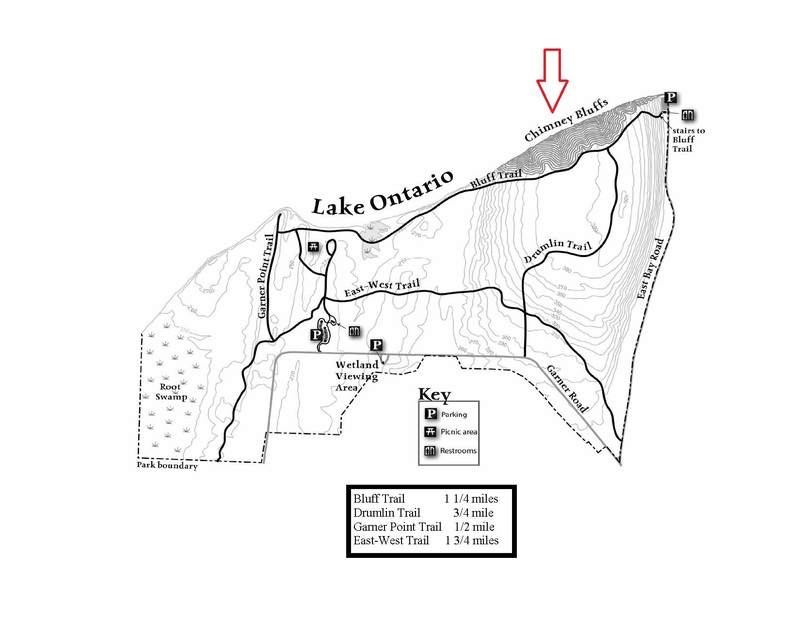 These hills usually form in clusters; the exposed upglacier end of the drumlin at Chimney Bluffs State Park is one of roughly 10,000 drumlins located south and east of Lake Ontario. The term drumlin refers to the hill’s shape, not its composition. Some drumlins are solid rock and some are composed of glacial till. Till is a mixture of different sized rock fragments and sediment deposited as glacial ice melts. 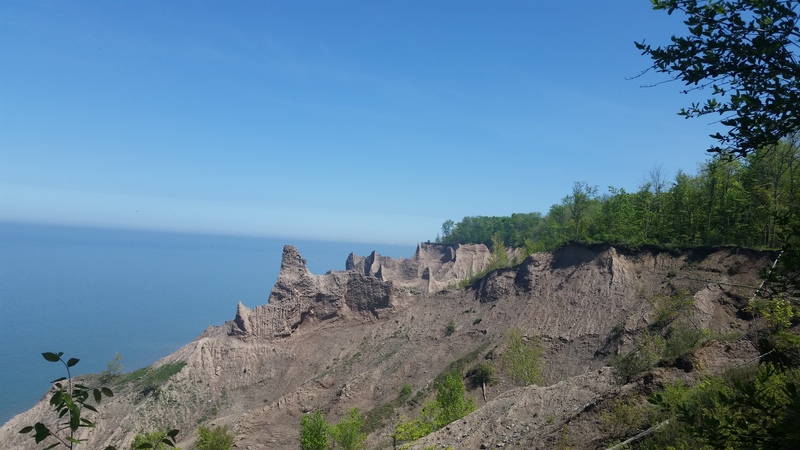 The drumlin at Chimney Bluffs State Park formed when one glacier melted and deposited the till, later a south moving glacier reshaped the material into its present shape. The north end of the drumlins has been eroded by thousands of year of wave action, wind, rain and snow. As the north end erodes the exposed material is carved into magnificent and ever changing formations. The bluffs are constantly changing source of beauty and danger. Post by Josh Teeter, OPRHP.